How healthy is your blood pressure? And exactly what causes high blood pressure, anyway? It rises with each and every heartbeat and then falls as your heart relaxes between beats. It can change from minute to minute with exercise, stress, sleep, even your posture. The important thing is you want to keep it in the healthy range: Less than 120/80 mm Hg – less than 120 systolic and less than 80 diastolic – for adults age 20 and over. Most Americans, though, are reading closer to 140/90 or higher, which puts them in the high blood pressure range. That news is grim. The U.S. Center for Disease Control and Prevention (CDC) says that the proportion of Americans reporting they have high blood pressure rose nearly 10 percent from 2005 to 2009. High blood pressure, or hypertension, affects nearly one-third of Americans. And nearly half of those cases are out of control, health officials say. 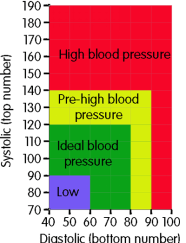 Furthermore, nearly one in three Americans has prehypertension – a condition which shows elevated blood pressure numbers which can progress into hypertension. Both men and women are about equal when it comes to the likelihood of developing high blood pressure, but their risks vary at different ages. More men are affected than women before age 64. At 65 and over, more women than men have high blood pressure. Given the sheer numbers of people who have high blood pressure, it’s important to understand the causes of blood pressure issues, reduce your risk and start checking your blood pressure regularly. Most people with high blood pressure don’t even know they have it because it’s considered a “silent killer” – there are no signs or symptoms. A few people early on may have dull headaches, minor dizzy spells or a few more nosebleeds than usual; but these symptoms don’t often come up until the disease reaches the later, life-threatening stage. BPAs: A chemical found in the lining of some cans and plastic bottles. It is thought to have the potential for seeping into food and drink, raising blood pressure. Studies have shown that chronic exposure to BPA is associated with the development of heart disease and hypertension. Sugar: This food not only increases your weight, but has been found to also contribute to higher blood pressure as well, even more so than salt consumption. In particular, fructose is being blamed for much of this as it is generally added to processed foods and drinks. Sleep apnea: A disorder characterized by loud snoring and restless nights, sleep apnea is well known for increasing blood pressure. The National Sleep Foundation says this is because when your breathing is interrupted, the oxygen levels in your blood falls, which leads to a cascade of effects ending in the tightening of blood vessels. Loneliness: This not only takes its toll on your confidence, happiness, and stress levels, but it can also affect your blood pressure. A five-year study at the University of Chicago showed a direct correlation between loneliness and high blood pressure among people 50 years old and up. This could possibly be due to increased levels of stress. Thyroid problems: The thyroid is a gland found in the body helping to regulate several aspects of your metabolism. Those who have low levels of thyroid hormone have been associated with high blood pressure compared to those with normal functioning thyroid glands. You eat too much salt or sugar: Sugar has been found to be as bad or even worse for your blood pressure as salt. Studies have found that high sugar levels affect the hypothalamus in the brain, causing it to signal the heart to beat quicker and blood pressure to rise. Additionally, high blood sugar increases your insulin levels, which may cause the heart to beat faster. It is recommended to reduce your daily consumption of sugar. You don’t eat enough fruit and vegetables: Full of vitamins, minerals, and fiber, all of which help to keep your body running in good condition. Substituting processed foods for fruits and vegetables can not only make you feel great but also help lower blood pressure. You are not active enough: Physical activity is known for helping control high blood pressure levels, with inactivity being linked to increases in blood pressure. Staying active help exercise your heart and muscles, allowing them to perform optimally. You are overweight: Carrying excess pounds makes your body work harder to push blood to all of its tissues and organs. This leads to an inevitable rise in blood pressure. Nearly everyone who is overweight will have high blood pressure, with the simple remedy being weight reduction. You are a smoker: Smoking is the number one cause of preventable disease. It can also affect blood pressure, as nicotine increases heart rate and constricts blood vessels — both of which contribute to increased blood pressure. You drink too much alcohol: Drinking too much at unhealthy levels can contribute to high blood pressure. It is advised to seek help if you find you have an addiction to alcohol, as it can also cause many other unwanted side-effects if abused. Alcohol also contains calories, which may contribute to weight gain. Also note that statistics show family history plays a role. You are at higher risk of being in the high blood pressure range if other members of your family have or have had high blood pressure. Some people, too, may have high blood pressure that is linked to another medical condition, such as diabetes or kidney problems. Often treatment for these other conditions will bring their blood pressure back down from the high blood pressure range to healthy control. There are natural, healthy ways to controlling blood pressure before turning to prescription medication. The three-pronged approach of a healthy diet, weight management and exercise is where you want to start. In fact, if you do require medication after you’ve developed a heart-healthy lifestyle, exercise makes blood pressure medication more effective. Good to know! 30 min exercises: You can reap the benefits of exercise with just 30 minutes a day. Grab a friend or your dog for a good walk and get your arms (and heart) pumping. Ride bikes with your kids or grandkids. Housework, climbing stairs, standing while preparing meals – all those activities count. The important thing is to find activities you enjoy, like gardening, tai chi or swimming in a salt water pool (easy on those joints). Mini-workouts: If you can’t manage 30 minutes straight, try three mini-workouts. Go up and down the stairs for 10 minutes or park your car at the back of the parking lot so you can walk a little further to the grocery store. Other Exercises: And strengthen that heart muscle with resistance training, like yoga poses that use your body weight to build strength. Or exercise bands that you can tote anywhere and do some simple bicep curls and leg lifts. Getting active doesn’t have to be jogging for miles on end. It’s easier than you think, once you fit it into your lifestyle in ways that are fun and convenient. We hear a lot about avoiding salt or sodium, but it’s hidden in so many foods. When it comes to eating well for controlling blood pressure, you want to reduce your packaged and processed foods, and eat more nutrient-rich whole foods. Yes, spend more time in the kitchen with fruits and vegetables, lean proteins, healthy grains and healthy fats. To balance your salt, make sure to get a lot more potassium, from foods like apricots, avocado, bananas, cantaloupe, honeydew, kiwis, lima beans, oranges, potatoes, prunes and squash. Tasty, right? Watch your sugar intake, too. Sugar messes with your blood sugar levels; elevated insulin puts you at risk for diabetes, but it’s also linked with increased triglycerides, bad cholesterol and high blood pressure. Sugar also has a hand in atherosclerosis, where sticky material collects along the walls of the arteries. That narrows the arteries and increases the pressure. If you’re exercising regularly and eating well, your weight will fall into place. And that’s essential for controlling blood pressure. Added pounds make your heart work that much harder. Carrying extra weight around your waist puts you at greater risk of high blood pressure. In nearly every case, when the unwanted weight comes off, high blood pressure is reduced or eliminated altogether. So it’s worth the effort to get active and eat well – and turn these into habits for life. You do want to keep your cool to help with controlling your blood pressure (and avoid getting red in the face). It makes a huge difference. Simple deep breathing, right from the belly, can help calm the nervous system. Yoga and meditation can help, of course, but even taking a break to clear you mind and move around for a few minutes will help. If you’re not a drinker, don’t start! But a little alcohol can be good for you, no more than two drinks a day for men or one for women. Tobacco, on the other hand, is just plain nasty for your heart. It hardens your arteries and the walls of your blood vessels. It also reduces the space in your arteries so the pressure increases. Not good! Nix the habit altogether. With these good habits well in hand, your heart will be in good care. Controlling blood pressure, and keeping yourself well out of the high blood pressure range, will significantly reduce your risk of the big ones: Heart attack and stroke. The side benefit to all this? Your overall health and energy will flourish. It’s worth putting in the work.